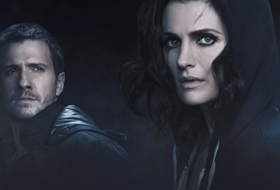 When we sat down with Serbian-Canadian-American Stana Katic of the internationally famed TV series ‘Castle,’ we had no idea the response it would elicit from social media. Hundreds of likes, shares, re-tweets, comments and messages later from fans (both ours and her so-called ‘Stanatics’) we truly understand why this endearing woman has won the hearts of audiences globally. 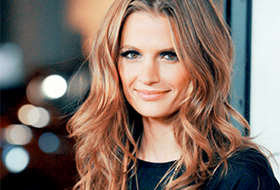 Stana is a quirky, down to earth, warm, funny and deeply analytical woman…and of course, needless to say, GORGEOUS. Excerpt from the exclusive interview with Stana in Vouliagmeni. Q: How do you like Greece, what is your impression? Has the reality of Athens been different than your expectations? Q: So, this is your 7th season playing Beckett. She is now an integral part of you really. How do you relate to her? In what ways are you similar and in what ways are you different? A: Other than looking alike (haha) I learn a lot from her. She’s very black and white. I am a little bit more hippie, rock n roll than she is. But in the recent seasons, she’s acquired this edge. I’m a bit more girly and goofy than she is. I admire her because she is a woman who is in charge of a Detective force. That’s bloody impressive–and she does it in heels! Q: How has your role changed as an actress through the seasons? A: As an actress over the years you learn a bit more stamina in terms of lifestyle. The grab bag of tools you have available to you improves–it evolves and you become more efficient. At the same time, as an actress on a show like this you have to be careful to not become complacent in the performance. It’s interesting as I have learned a lot year-to-year and have grown. It’s exciting to both play Beckett but also step away and play other characters during the hiatus, I am fortunate as I have a great balance of both. It’s nice to have the security of having a role that is so well received internationally but its also really wonderful, creatively fulfilling and inspiring to go work elsewhere with other creatives. As far as Beckett and her growth, she has developed colours and layers and they have opened her up–but they’ve had to, right? She’s a woman in authority and I believe women in this position have to wear all kinds of hats in their lives. We’ve been able to showcase all the sides of her: the vulnerable side, the romantic side, the playful side, the strong side and I think that’s very relate-able and believable. When it comes down to it, she’s emotionally driven because the murder of her mother is the reason she became a police officer. This gives her a strong quest for justice and makes her a more lethal force to contend with. Q: Does it have its own type of pressure to have a lead role in such a successful series–personally and professionally? A: he show wants to maintain a standard. The bar has been raised now as after six seasons, this last season was its best rated year which is very unusual and uncommon. I think everyone at the helm of that wants to keep it going at that level. Personally, I’m not driven by the show’s popularity of financial success. Success for me is something creatively inspiring and it can be anything–working with an amazing photographer, it could be music, it could be anything. It just has to be satiating creatively. Q: Why do you think Castle has become the success it has? What contributes to? A: It has a little bit of everything, it is like dessert after dinner—it has drama, romance, comedy and suspense. Each episode is like a finished package, people can come in after missing a week and pick up where they left off. It makes it easy to jump and jump out. The characters are alive, complex, unusual but believable. Q: Can you tell us any spoilers or hints about Season 7? A: They are currently writing the Season 7 script in LA so we are all riding the exact same wave! When I return in mid-July I will have the answer to this question but as of now, I don’t know a thing. The end of season 6 was so shocking even for myself so I have no idea how we are going to come away from that. Q: Post Castle, what are your future plans and goals? Is there a specific role you would like to play? A: I am open to seeing what happens next, I hope for roles that are engaging, interesting and constantly challenging. As an actress I hope for roles that will challenge audiences, I love vivid storytelling if I can dive into something that will be satisfying in that way, but I have no idea what sort of story I would like to take on next! Q: What were you doing in Florence? A: I am working on a film there right now called “The Tourist” that is centered around this game Calcio Storico (i.e. historic football). It has been played for hundreds of years in Italy and still is to this day. It’s a combination of football and battle–its very aggressive and rough. I play an American immigrant in Italy that has related to the lead character and opens a doorway for him to enter this sport. Q: I heard you are quite the avid reader, what are you reading right now? A: “A Story Lately Told” by Anjelica Huston and “Autobiography of a Yogi” by Paramahansa Yogananda. Q: I heard you have a project called ATP, could you elaborate on that? A: Alternative Travel project is an initiative that I founded that aims to encourage people to get out of the bubble of their cars and to go car-free for one entire day. I founded it because LA is a very car centric culture and it makes it challenging for people to feel connected to a community–especially as a newcomer–and it separates and ostracizes people in a way. So ATP aims to encourage you to walk, cycle or use public transit for one day. People have been committing to it all over the world and it has positive effects on the environment, socially, etc.